Matthew McConaughey once said that sometimes you need to go back to move forward. The team at DICE must have been very moved by that sentiment. 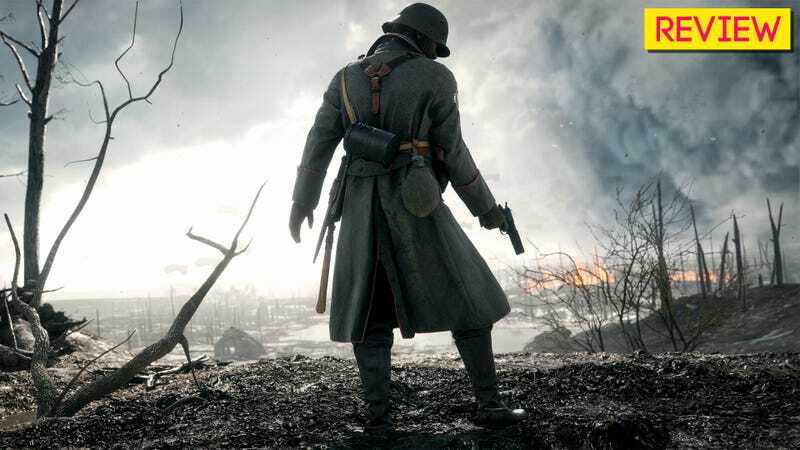 Taking it to heart and pushing the Battlefield series nearly 100 years back into World War I for this year’s release of Battlefield 1 was a gamble. It has largely paid off. The Battlefield first-person shooter series has incrementally embraced modern warfare and its technology ever since 2005's Battlefield 2. Only smaller projects like Battlefield Vietnam explored the series’ potential for diverse historical settings. By 2013's Battlefield 4, players may have been exhausted with all the attack choppers, AK-47s, and Abrams tanks. Suffused in the same military fetishization gleefully exhibited by its rival series, Call of Duty, Battlefield was wasting away. Battlefield 1 reinvents the tone of the series, retaining the awesome turbulence of war while emphasizing a human element. The game shows the storming of the beaches at Gallipoli but also takes time to have a young soldier vomit with dread as he observes the mass of dead bodies. Battlefield 1 maintains an impressive balance between emotion and spectacle. All the better for a series that was starting to feel a bit too clinical. This is the first Battlefield title to offer a campaign mode on par with the standards set by games like Modern Warfare. Players can play through five story episodes. Various Allied viewpoints from the war are available and highlight key theaters in the war. From the high mountains of Italy to the muddy trenches of Cambrai, the campaign goes to great lengths to show the global nature of the conflict. The strongest include a chapter focusing on plane combat unreliably narrated by an American volunteer and a story where players take on the role of a deadly Bedouin woman fighting alongside T.E. Lawrence. Battlefield 1 uses these campaign stories to express the grand scope and devastating cost of the war. They play like a cross between a history channel special and a serial adventure episode, capturing key moments of history while adding fictional embellishments to tell stories of brotherhood, bravery, and blood. At times, the story missions do not earn the gravitas offered. One clunky episode rushes through the Battle of Gallipoli while trying to tell a tale about a grizzled vet protecting a young recruit. Another exceptionally short mission attempts to tell a tale of brotherhood between Italian soldiers but largely fails. We do not always spend enough time with these characters to see their relationship develop to a level where their interactions and sacrifices resonate. In these moments, the dreadful seriousness that dominates earlier campaign missions turns maudlin and manipulative. Occasional attempts to explain the causality between the war and modern politics can feel similarly perfunctory. The campaign wishes to explore concepts like industrialization and colonialism but we are only ever told of their long term effects and not shown. The game might take time to highlight the fact that Britain and France reneged on their promise for Arab independence after the Ottoman Empire fell but these moments play like mere footnotes when they could have been leveraged for great emotional effect. What does the Bedouin protagonist think of this? We never learn. Educational opportunities are missed as well. The game is narrated by a member of the ‘Harlem Hellfighters’, a segregated unit of African American soldiers. He exists largely to tick a diversity box for marketing. The game does nothing to tell his story. The campaign eschews opportunities to comprehensively explore the setting in favor of a historical smorgasbord that falls short at times, presenting history without exploring it in full. Despite these minor stumbles, the campaign is the most remarkable aspect of Battlefield 1. The Great War marks a turning point in how war was fought. World War One was a Rubicon foolishly rushed over in the name of arcane imperial alliances. It was a disaster exacerbated by the liberal use of chemical weapons and new, industrial killing machines. Battlefield 1 doesn’t completely capture the horrors of the war but it doesn’t egregiously disrespect its setting either. That’s one side of the coin. What about the other? Simply put: Battlefield 1's multiplayer is the strongest in the series since Bad Company 2. It is full of grand feats of daring that are enhanced by the game’s tremendous sound and environmental design. The game retains series staples like the point-capturing Conquest mode or the limited respawn based Rush mode. The highlight is a new mode called Operations. It pits two forces against each other in a narrative experience based on real campaigns such as the trench battles of the Kaiserschlacht or the astoundingly bloody Meuse-Argonne Offensive. Teams battle for control of sectors, pushing back and forth to create a miniature story. It is a demanding game mode, with matches lasting close to an hour. They are an indispensable cornerstone of Battlefield 1's online experience. The multiplayer benefits from less glamorous back-end improvements. It’s much easier in this Battlefield to create custom games and browse for the maps you want to play on. Battlefield 1 ditches EA’s absurd and convoluted Battlelog social platform, returning to an in-game server browser. Again, sometimes you need to go back to go forward. There’s a deliberate quality to multiplayer in Battlefield 1. The aged, ramshackle weaponry slows the pace just enough to give each action the player takes more purpose. There are plenty of loud, dangerous charges up hills and tight trench battles, but they are counterbalanced by Hail Mary sniper shots and gut-wrenching melee executions. 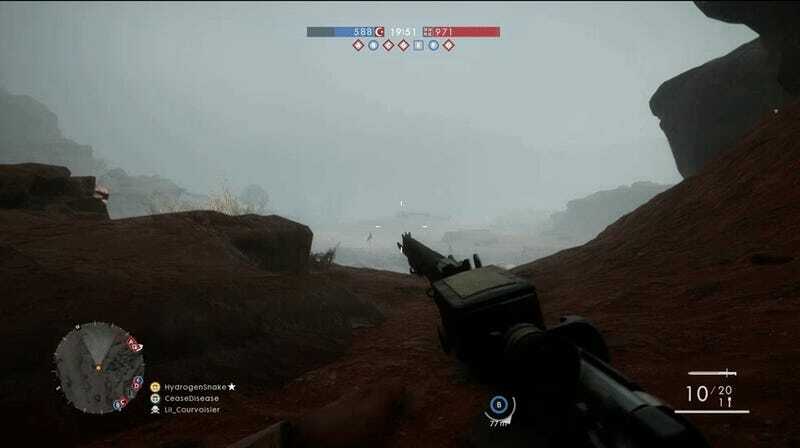 Dynamic weather effects sometimes fill maps with heavy mist, torrential rain, or furious sandstorms without warning. The shifting tone helps prevents matches from feeling repetitive. The AAA commercialization of war is among the video games industry’s worst traits. It packages the blood, sweat, and sacrifice of our ancestors into a “fun” consumer product or else cynically speculates a future defined by unending war. With Battlefield 1, DICE managed to create an experience that generally sidesteps poor taste in favor of something respectful, if sometimes a bit too romantic. 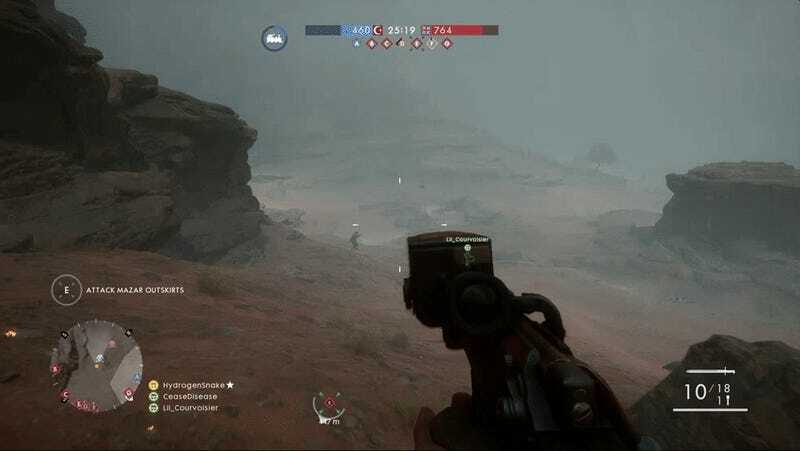 There is a fundamental tension between the single player’s gravitas and the goofier components of multiplayer but in spite of this Battlefield 1 is a compelling and refreshingly honest AAA title. There are some small annoyances. The lack of a French campaign or Central Powers story mission is a disappointment given how comprehensive Battlefield 1 wants to be in covering the war. Missing features like a gun practice range or even the simple ability to alter your loadouts from the main menu begin to devalue the multiplayer experience. The game is nevertheless a remarkable overachiever. Battlefield 1's creators could have taken the easy road. They could have omitted a campaign. They could have hastily assembled its multiplayer like the atrociously conceived Star Wars Battlefront. They didn’t. In this day and age, that makes all the difference in the world and it made all the difference here. Battlefield 1 could have been a disrespectful mess. Instead, it rises above to deliver an outstanding historical shooter.